Low Calorie Salad Dressing Recipes that are low glycemic too! Low calorie salad dressing recipes need to be low glycemic too so you can avoid sugar cravings! Most commercial salad dressings contain high glycemic ingredients that will set you up for sugar cravings. It's so important to read labels, make your own dressings whenever possible, and even in a restaurant, just ask for oil and vinegar on the side. Restaurant salad dressings almost always have additives, usually maltodextrins. They may even say "no sugar" but these carbohydrate additives act like sugars and spike your blood sugar. This recipe is one of our printable low glycemic index recipes. To make your life easy, make a large portion of the low calorie salad dressing from the recipe below so you always have some on hand. Use a mason jar and shake well before each serving. Here's a hint for many more low glycemic/low calorie salad dressings. You can vary this recipe by adjusting the amount of garlic, using fresh, chopped basil (1 T.) instead of garlic or lemon juice instead of vinegar. Try adding a teaspoon of Dijon mustard instead of the garlic and leaving out the parmesan. There are lots of possibilities. This recipe will be enough for several, large family salads or about 2 1/2 weeks of salad for a couple or single person. Mix the ingredients in a mason jar and shake well. Coconut palm sugar is low glycemic and will not raise your blood sugar. Refrigerate, shake and use as needed, 1/2 tablespoon of dressing for a single serving and 2 tablespoons for a large salad or enough to just cover the greens lightly. 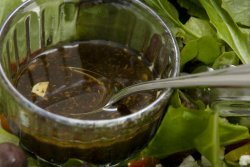 For another low calorie salad dressing see our Thai dressing here. This is a very spicy dressing and will liven up any mild main course. This salad dressing works well with Asian food of course, but also on any main course salad that includes fish or chicken. The high glycemic additives in restaurant salad dressings can spike your blood sugar. This is a case of making a little effort and having a big impact. Your own salad dressing made from scratch will taste so superior to anything you buy in a bottle that your salads will become that much more interesting. Not to mention they will be low glycemic and better for your weight management. Here's another benefit to eating salads with your meals. When you eat a meal that includes a salad with one of these low calorie salad dressing recipes, you actually reduce the glycemic impact of the meal! Eating a salad with oil and vinegar or oil and lemon juice greatly reduces the glycemic response of what you've just eaten. Return from Low Calorie Salad Dressing Recipes to Low Glycemic Recipes. Return from Low Calorie Salad Dressings to Lifetime Fat Loss home page.